Hello readers today let's talk about makeup, but about one lipstick only. A few months ago I was preparing my trip to India so I went to the huge high-end mall, Les Galeries Lafayettes in Paris to find a long lasting foundation that could handle the warm and humide climate of Chennai, India. When you go to this mall you always end up leaving with more than what you were supposed to; and that's exactly what happenned to me that day. As I was looking for my future fondation I ended up at NARS counter and got attracted by purple, pink and plum colors; from their eye shadows to their lipsticks. 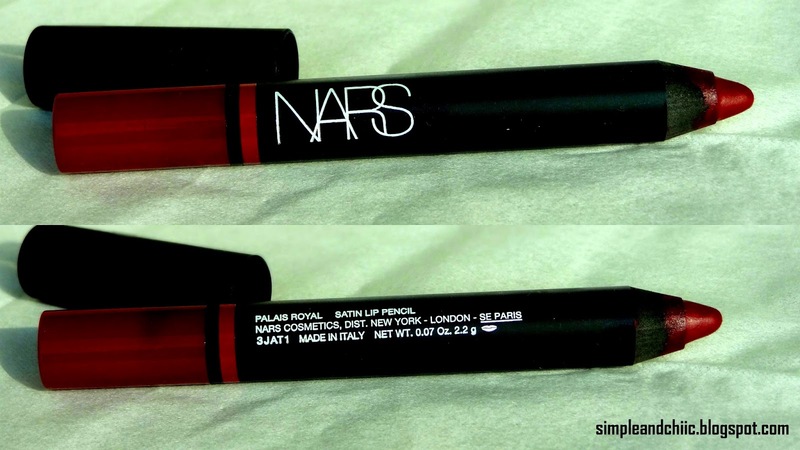 I bought my very first lipstick from NARS years ago so I know how good they are and that day I fall in love with several things included the below satin lip pencil in Palais Royal. The color is a a beautiful bright plum which up close looks like a mix of red, pink and purple. It is difficult to explain that is why you have the pictures. What about you? Do you have any favortite lipstick at the moment ?